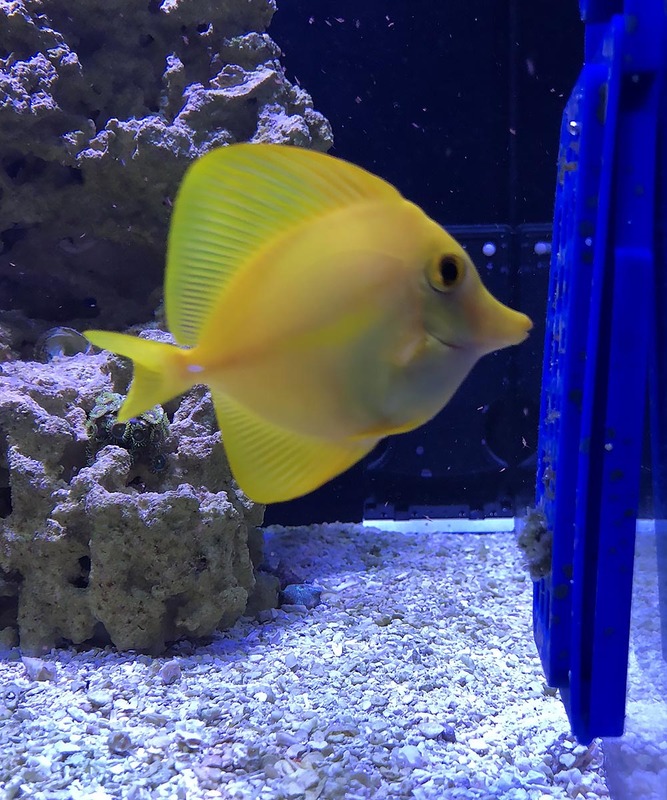 MiniWaters.fish customer Matt Deyoe volunteered an update on one of the first-ever-available captive-bred Yellow Tangs, Zebrasoma flavescens, (produced by the Oceanic Institute of Hawaii Pacific University), and was gracious enough to let us share it with you! In spring of 2016 you sold me one of the first CB Yellow Tangs. Just wanted to send over an update saying the Tang is still going strong! The Tang has moved from our old home to an apartment. And moved again recently from the apartment to a new home. The Tang now happily resides in a 110-gallon Red Sea aquarium now. It eats anything I put in there. Seaweed from Rods Foods, LFS frozen foods, pods, and dry pellets from Reef Nutrition….and so on. I included a picture so you could see the little one in the new tank. This entry was posted in News & Notes and tagged captive-bred, Oceanic Institute of Hawaii Pacific University, Yellow Tang, Zebrasoma, Zebrasoma flavescens.